Introduction: Much of my life has been spent exercising. Most of this exercise has been done with sheer delight. Since receiving my Parkinson’s diagnosis, my opinion of exercise has changed. With Parkinson’s, I’m now exercising as if my life depends on it. Why? Animal models (mouse and rat) of Parkinson’s have convincing shown the effect of exercise-induced neuroplasticity. These animal studies demonstrated neuroprotection and even neurorestoration of Parkinson’s. But we’re neither mice/rats nor are we an animal model of Parkinson’s disease; thus, this post is an update on exercise-induced neuroplasticity in human Parkinson’s. 9 Things to Know About Exercise-induced Neuroplasticity in Human Parkinson’s: Neuroplasticity, neuroprotection and neurorestoration are catchy words that populate a lot of publications, blogs from many of us with Parkinson’s and from professionals who study/work in the field of Parkinson’s. It is important for you to develop your own opinion about exercise-induced neuroplasticity. My goal in this post is to provide the basic elements, concepts and key reference material to help you with this opinion. 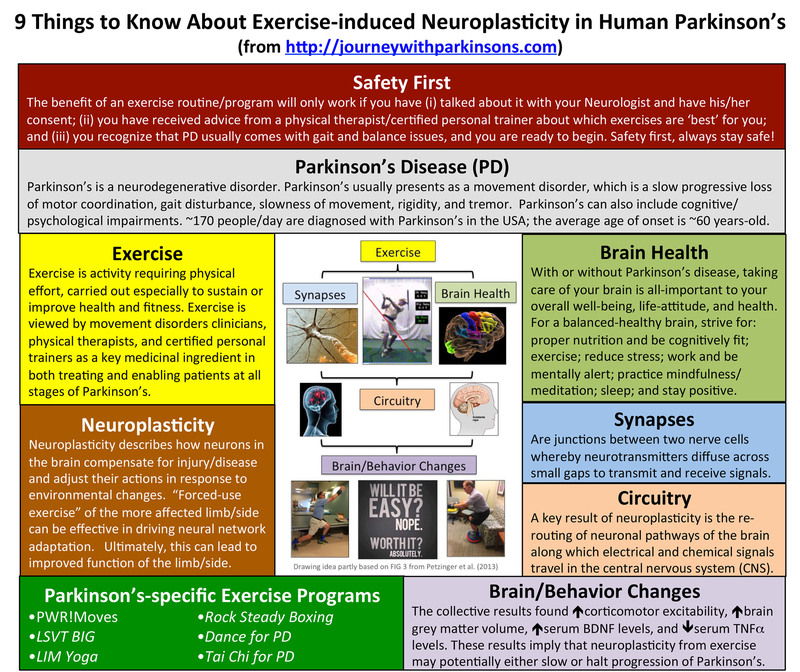 Here is a 1-page summary of “9 Things to Know About Exercise-induced Neuroplasticity in Human Parkinson’s” (click here to download page). (1) Parkinson’s Disease (PD): Parkinson’s is a neurodegenerative disorder. Parkinson’s usually presents as a movement disorder, which is a slow progressive loss of motor coordination, gait disturbance, slowness of movement, rigidity, and tremor. Parkinson’s can also include cognitive/psychological impairments. ~170 people/day are diagnosed with Parkinson’s in the USA; the average age of onset is ~60 years-old. (2) Safety First: The benefit of an exercise routine/program will only work if you have (i) talked about it with your Neurologist and have his/her consent; (ii) you have received advice from a physical therapist/certified personal trainer about which exercises are ‘best’ for you; and (iii) you recognize that PD usually comes with gait and balance issues, and you are ready to begin. Safety first, always stay safe! (3) Exercise: Exercise is activity requiring physical effort, carried out especially to sustain or improve health and fitness. Exercise is viewed by movement disorders clinicians, physical therapists, and certified personal trainers as a key medicinal ingredient in both treating and enabling patients at all stages of Parkinson’s. (4) Brain Health: With or without Parkinson’s disease, taking care of your brain is all-important to your overall well-being, life-attitude, and health. For a balanced-healthy brain, strive for: proper nutrition and be cognitively fit; exercise; reduce stress; work and be mentally alert; practice mindfulness/meditation; sleep; and stay positive. (5) Neuroplasticity: Neuroplasticity describes how neurons in the brain compensate for injury/disease and adjust their actions in response to environmental changes. “Forced-use exercise” of the more affected limb/side can be effective in driving neural network adaptation. Ultimately, this can lead to improved function of the limb/side. (6) Synapses are junctions between two nerve cells whereby neurotransmitters diffuse across small gaps to transmit and receive signals. (7) Circuitry: A key result of neuroplasticity is the re-routing of neuronal pathways of the brain along which electrical and chemical signals travel in the central nervous system (CNS). What types of exercise are best for people with Parkinson’s disease? Here is a nice overview of the benefits of exercise for those of us with Parkinson’s (click here). Regarding the PD-specific exercise programs, I am most familiar with PWR!Moves, Rock Steady Boxing and LSVT BIG (I’m certified to teach PWR!Moves, I’m a graduate of LSVT BIG, and I’ve participated in Rock Steady Boxing). A goal for you is to re-read ‘Safety First’ above and begin to decide which type of exercise you’d benefit from and would enjoy the most. (9) Brain/Behavior Changes: The collective results found increase in corticomotor excitability, increase in brain grey matter volume, increase in serum BDNF levels, and decrease in serum tumor necrosis factor-alpha (TNFα) levels. These results imply that neuroplasticity from exercise may potentially either slow or halt progression of Parkinson’s. What the terms mean: Corticomotor describes motor functions controlled by the cerebral cortex (people with Parkinson’s show reduced corticomotor excitability). Brain grey matter is a major component of the central nervous system consisting of neuronal cells, myelinated and unmyelinated axons, microglial cells, synapses, and capillaries. 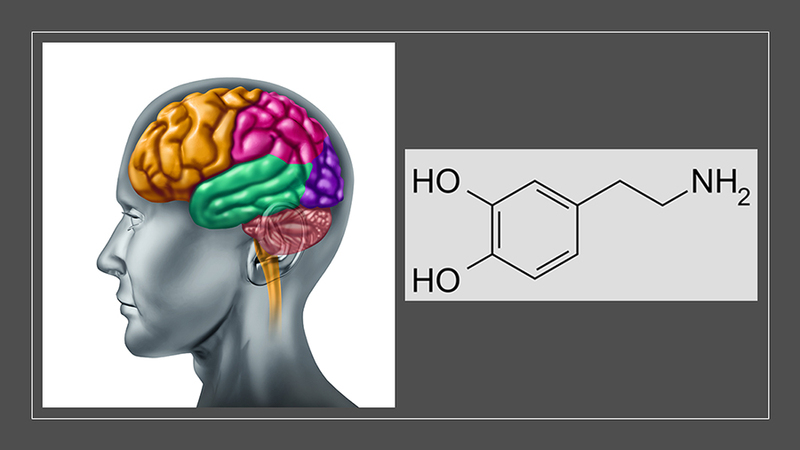 BDNF is brain-derived neurotrophic factor, which is a protein involved in brain plasticity and it is important for survival of dopaminergic neurons. Tumor necrosis factor-alpha (TNFα) is an inflammatory cytokine (protein) that is involved in systemic inflammation. Some studies of exercise-induced neuroplasticity in human Parkinson’s found the above-mentioned changes, which would imply a positive impact of exercise to promote neuroplastic changes. What can you do with all of the cited articles listed at the end? Compiled below are some comprehensive and outstanding reviews about exercise-induced neuroplasticity in Parkinson’s. Looking through these papers, you’ll see years of work, but this work has all of the details to everything I’ve described. What I believe about neuroplasticity and exercise in Parkinson’s: [Please remember I am not a physician; definitely talk with your neurologist before beginning any exercise program.] I think about exercising each day; I try to do it on a daily basis. As a scientist, I’m impressed by the rodent Parkinson’s data and how exercise promotes neuroplasticity. The human studies are also believable; sustained aerobic exercise induces neuroplasticity to improve overall brain health. “Forced-use exercise” is an important concept; I try to work my right-side (arm and leg), which are slightly weaker and stiffer from Parkinson’s. Initially, I used my left arm more, now I ‘force’ myself on both sides with the hope my neural network is stabilized or even improving. If you enjoy exercising as I do, I view it as both an event and a reward; ultimately, I believe it can work and improve my response to Parkinson’s. If you don’t enjoy exercising, this may be more of a task and duty; however, the benefits over time can be better health. Exercise is good for you (heart and brain). Begin slow, make progress, and see if you are living better with your disorder. Remain hopeful and be both persistent and positive; try to enjoy your exercise. Farley, B. G. and G. F. Koshland (2005). “Training BIG to move faster: the application of the speed-amplitude relation as a rehabilitation strategy for people with Parkinson’s disease.” Exp Brain Res 167(3): 462-467 (click here to view paper). Fisher, B. E., et al. (2008). “The effect of exercise training in improving motor performance and corticomotor excitability in people with early Parkinson’s disease.” Arch Phys Med Rehabil 89(7): 1221-1229 (click here to view paper). Hirsch, M. A. and B. G. Farley (2009). “Exercise and neuroplasticity in persons living with Parkinson’s disease.” Eur J Phys Rehabil Med 45(2): 215-229 (click here to view paper). Petzinger, G. M., et al. (2010). “Enhancing neuroplasticity in the basal ganglia: the role of exercise in Parkinson’s disease.” Mov Disord 25 Suppl 1: S141-145 (click here to view paper). Bassuk, S. S., et al. (2013). “Why Exercise Works Magic.” Scientific American 309(2): 74-79. Lima, L. O., et al. (2013). “Progressive resistance exercise improves strength and physical performance in people with mild to moderate Parkinson’s disease: a systematic review.” Journal of Physiotherapy 59(1): 7-13 (click here to view paper). Petzinger, G. M., et al. (2013). “Exercise-enhanced neuroplasticity targeting motor and cognitive circuitry in Parkinson’s disease.” Lancet Neurol 12(7): 716-726 (click here to view paper)..
Ebersbach, G., et al. (2015). “Amplitude-oriented exercise in Parkinson’s disease: a randomized study comparing LSVT-BIG and a short training protocol.” J Neural Transm (Vienna) 122(2): 253-256 (click here to view paper). Petzinger, G. M., et al. (2015). “The Effects of Exercise on Dopamine Neurotransmission in Parkinson’s Disease: Targeting Neuroplasticity to Modulate Basal Ganglia Circuitry.” Brain Plast 1(1): 29-39 (click here to view paper). Abbruzzese, G., et al. (2016). “Rehabilitation for Parkinson’s disease: Current outlook and future challenges.” Parkinsonism Relat Disord 22 Suppl 1: S60-64 (click here to view paper). Tessitore, A., et al. (2016). “Structural connectivity in Parkinson’s disease.” Parkinsonism Relat Disord 22 Suppl 1: S56-59 (click here to view paper). Thanks for your helpful comments, pickleball does sound like fun. I will look into it as an additional form of exercise. I am recently diagnosed with Parkinsonism. I am choosing not to do meds. I live in Durham and would like to do PWR! without going to Arizona. do you do individual or group sessions?